Do your neurons fire together? Are your neurons experiencing culture conditions that promote, rather than inhibit, neuronal activity and function? Your neuronal cultures should mimic the physiological conditions in the brain as closely as possible, whether you are measuring complex interactions of induced pluripotent stem (iPS) cell-derived neurons or studying rodent neuronal biology in a controlled environment. Cells that fire together wire together"
When an axon of cell A is near enough to excite a cell B and repeatedly or persistently takes part in firing it, some growth process or metabolic change takes place in one or both cells such that A's efficiency, as one of the cells firing B, is increased. Hebb, D.O. (1949). The Organization of Behavior. New York: Wiley & Sons. Meet the scientists behind the papers. We ask neuroscientists about their research, what motivates them, and why they published with BrainPhys™. Why Is It Important to Culture Active Neurons? Dr. Cedric Bardy discusses why and how he created a novel neuronal basal medium to support neuronal growth under brain-like physiological conditions. Kutsche LK et al. (2018) Combined Experimental and System-Level Analyses Reveal the Complex Regulatory Network of miR-124 during Human Neurogenesis. Cell Syst, 7(4):438-52. Bell S et al. (2018) Disruption of GRIN2B Impairs Differentiation in Human Neurons. Stem Cell Reports, 11(1):183-96. Saber WA et al. (2018) All-Optical Assay to Study Biological Neural Networks. Frontiers in Neuroscience. 12:451. Kim Y et al. (2018) Mitochondrial Aging Defects Emerge in Directly Reprogrammed Human Neurons due to Their Metabolic Profile. Cell Rep., 23(9):2550-8. Gabriel E et al. (2017) Recent Zika Virus Isolates Induce Premature Differentiation of Neural Progenitors in Human Brain Organoids. Cell Stem Cell, 20(3):397-406. Jackson TC et al. (2018) BrainPhys® increases neurofilament levels in CNS cultures, and facilitates investigation of axonal damage after a mechanicacal stretch-injury in vitro.) Exp Neurol. 2018 300:232-246. Our goal was to develop a culture condition that would support both healthy neuronal circuits and let us monitor the functional properties of mature neurons, without having to switch to different media. Specifically, we reasoned that such cell media should allow for optimal physiological neuronal activity. After sharing our work with our colleagues, we wanted to make this neuronal medium easily available to the scientific community. Realizing the shortcomings of traditional culture media, Cedric Bardy, in the laboratory of Fred H. Gage, set out to identify which properties could be altered to better support in vitro neuronal activity. They found many crucial neurophysiological properties to be impaired, such as action potential generation and synaptic activity. Their solution was the invention of a new tissue culture medium, BrainPhys™, published in 2015 (C Bardy et al. Proc Natl Acad Sci USA, 2015). In BrainPhys™, cultures experience brain-like physiological conditions and have a higher proportion of synaptically active neurons. 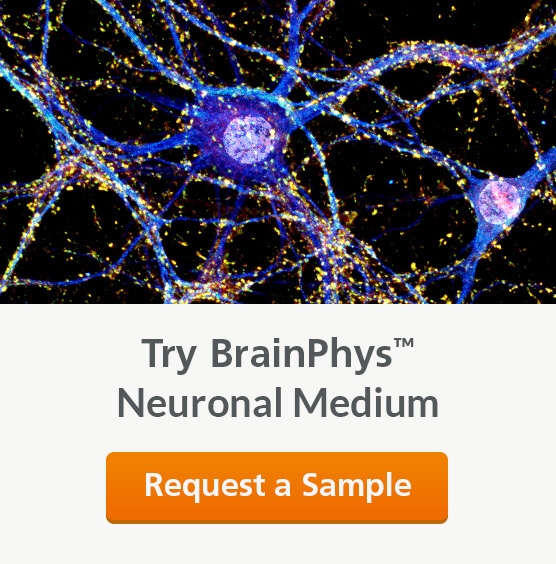 We developed BrainPhys™ Neuronal Medium based on this formulation, applying more than 20 years of experience in media manufacturing, together with industry-leading raw material screening and performance testing programs, to create a product with unfailing performance and minimal lot-to-lot variability.